With today marking the start of the UK Road Safety Week, a team of ten of the UK’s leading road safety professionals from the likes of Highways England, RAC Foundation and Transport for London have got together to debunk some popular myths around speed and road safety. Based on a Speed Summit supported by PACTS, the Parliamentary Advisory Council for Transport Safety, the team urge evidence-based solutions rather than conjecture to ensure lives are saved and injuries prevented. The report recognises resistance to the widespread use of speed humps and cameras in residential streets but acknowledges the effectiveness of average speed cameras strategically placed on some higher-speed roads. For example, the report includes a case study of the highly effective average speed camera scheme on the A9 in Scotland which has resulted in a 50% reduction in all casualties and a 33% cut in fatalities. “Managing speed can never be a one-size-fits-all process,” Walsh continued. “Cutting the number of fatal and serious, speed-related road crashes must make use of the wide range of effective, evidence-based speed management solutions available. For urban roads, the focus for Transport for London is on the 80% of all deaths and serious injuries on its roads that involve vulnerable road users: pedestrians, cyclists and motorcyclists. However, Richard Owen, director of road safety analysis, urges restraint in the rush to introduce blanket 20mph limits in all towns and cities. He says that 20mph zones normally have lower average speed already and achieve compliance and safety improvements through engineering and signing measures. Conversely, signed-only 20mph limits often see poor compliance. Early evidence from the latest and most comprehensive study suggests signed-only-limits result in just a 0.7mph reduction in average speeds. The Government has set a target to reduce the number of people who are killed or seriously injured on Highways England’s network by 40% by the end of 2020. Highways England cannot completely eliminate the risk presented by building, maintaining and operating the country’s high-speed road network but it can make sure that those risks are managed effectively and that their potential harm is radically reduced. “These different speed management solutions are known, understood and available: the important next step is implementation,” says Adrian Walsh. 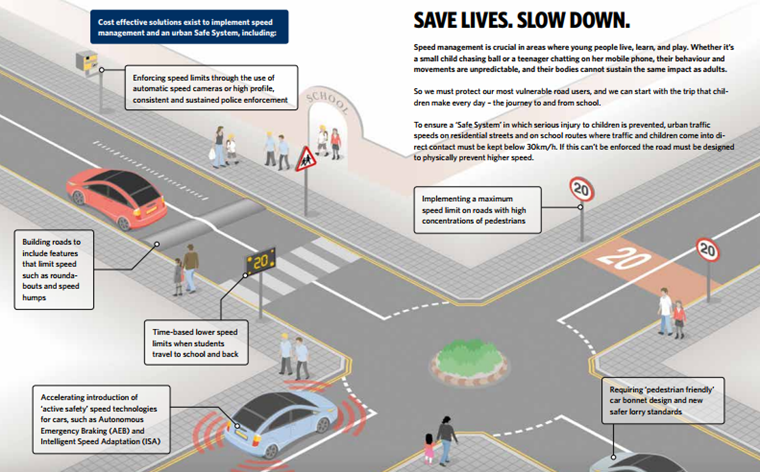 “With the 2020 Global target to reduce road fatalities by 50% fast approaching, local, regional and national governments are encouraged to implement effective speed management policies as a matter of urgency to further reduce casualties. Aside from the report, Brake has also revealed that road collisions account for one in five patients admitted to trauma centres – making road collisions the second largest cause of admissions to A&E in hospitals, behind from less than two metres. Almost a third (32%) of pedestrians, and almost a quarter (24%) of cyclists, suffer serious head injuries. Due to the severity of many road traffic collisions, almost a quarter (24%) of trauma patients go straight to intensive care following a crash. 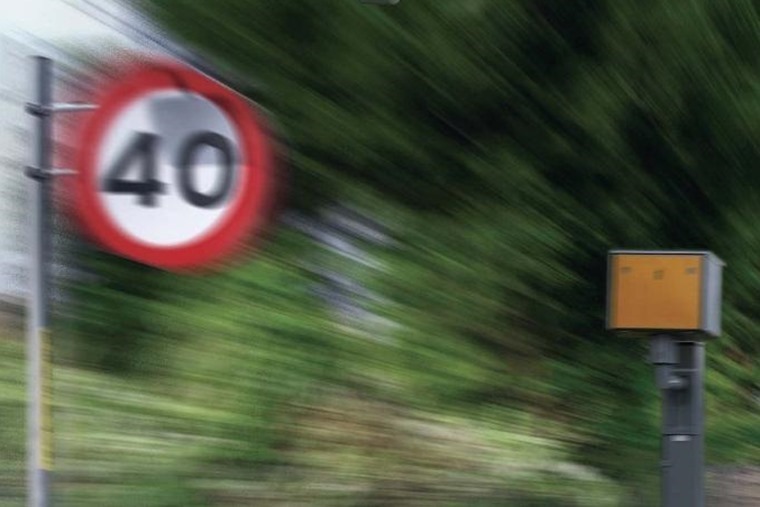 Recent figures from the Department for Transport reveal that exceeding the speed limit or travelling too fast for conditions contributed to 349 fatal collisions on roads in Britain last year – almost a quarter (22%) of all fatal crashes. Ben Walton, adult clinical lead for major trauma in the Severn area, hosted by North Bristol NHS Trust, said: “Road traffic incidents have a serious, often devastating impact on individuals and their families. Even if people survive and make it to the Major Trauma Centre - where specialists work together to help treat their different injuries - the long-term outcome can still be life-changing. “There are many ways in which road traffic collisions can be prevented. In particular we urge people to be mindful of the speed they are travelling."